Twilight Time has issued a new "restored" Blu-Ray for the the film, and it is a better looking and sounding version of the film than the 2003 DVD from Image, but it is not the equivalent of many restored films now on HD that look spectacular because they've been remastered from negatives or high quality prints. Often the comparison between a restored film on HD is up against old prints that have been used for VHS or streaming services, and the differences of the sources for the HD mastering can be considerable. The Twilight Time Blu-Ray for Stand-In is a clear improvement, but it is using less than optimum prints (there's a brief mention of this at the beginning of the film), but for a long neglected film like this, the difference on the screen is still an achievement (also the sound is greatly improved). This might be the "slickest" of Lubitsch's movies. He was a director that excelled in production excellence on his films, so by Heaven Can Wait, his 70th credit, his ability to make a "Lubitsch picture" glisten was complete. Somehow the movie itself is rather dry, though, however likeable Don Ameche (as 'doomed soul' Henry Van Cleve) is supposed to be. At his demise, Van Cleve goes to the gates of Hell and meets "His Excellency" Laird Cregar, and this is probably the high point of the movie, as Van Cleve begins trying to negotiate his way to damnation. Convinced his philandering (against his wife played by Gene Tierney) is enough to warrant the judgment, which he then details for the doubting devil, the real story is unfolded in flashback. Laird Cregar is the most interesting thing in Heaven Can Wait and personally I'd have preferred he tossed the erring Van Cleve into the flames, but Hollywood must have its way. Gene Tierney doesn't have much to do here accept react to things happening to her, and to dress well, and as I earlier mentioned, this is a Lubitsch production, so nothing seems left out in presenting the physical of the stage and cast to its best advantage. However, the story isn't up to the task of matching that effort. 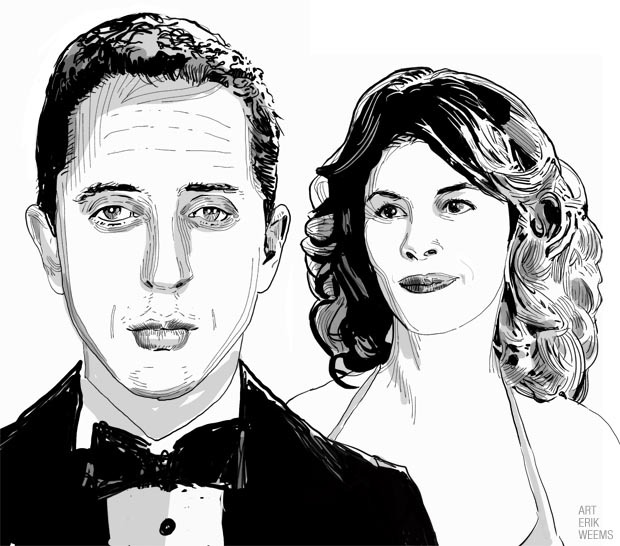 The Gold-digger movies of classic 1930s Hollywood (there were many, particularly from Warners Bros) are revived here in spirit with Hors de prix starring Audrey Tautou and Gad Elmaleh, a story where love triumphs over gold. Jean (Elmaleh) is a bartender in a luxury hotel near the sea, and Irene (Tautou) is a gold digger, a young woman who has worked her way into almost-but-not-quite marriage to an older man of extreme wealth. She's got a huge diamond engagement ring and is close to her goal, but her plan is destroyed in a flash when, drunk and lonely on her birthday, her impomptu affair with the bartender is observed. 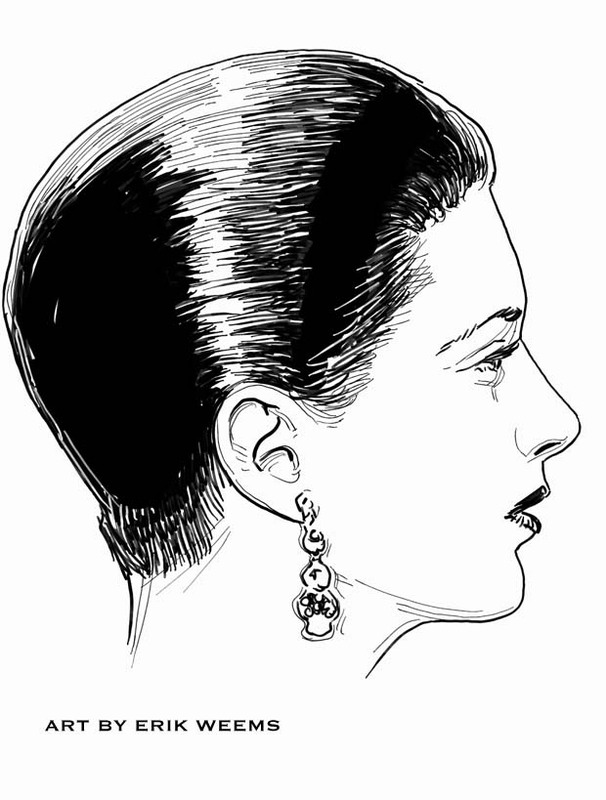 In an example of the strange justice within Priceless, as she used deceit to capture a wealthy man in her hope for securing her future, the deceit of the bartender (he pretends to be a guest of the hotel and not an employee) has wrecked her work. She even loses the grotesque engagement ring. Abandoned, humiliated and penniless, Irene allows the smitten (and now unemployed) bartender to pursue her, inflicting a higher and higher cost on him for her attentions until he has financially bankrupted himself. Satisfied that she has taught him a lesson that appears to be partially revenge but also an effort to wake the young man up to her idea of what 'reality' is, she then moves on to go after another older rich man in another hotel. But Jean isn't going to give up, and through humorous circumstances (Priceless is filled with convenient coincidence) he is taken on as a campanion by an older widow which puts Jean and Irene together in the same wealthy orbit of aged, lonely wealth and youthful hangers-on. Like Orpheus trying to get to Eurydice, Jean is an amateur now in a dark business, and Irene starts giving him tips and strategies for how to manipulate the situation, protect himself, and above all to rack up as many gifts as possible, this being the only pension available, short of the golden grail of marriage, in this occupation that is just a shade below (or above, depending on the point of view) to prostitution. But as Jean succeeds with his widow and Irene lines up a new target, the two are spending their "off work" hours together, and Irene begins to display a palpable discomfort with Jean's progress deeper into her world of fake love but real money. Priceless is a romantic comedy told well by director Pierre Salvadori who also cowrote the production with Benoît Graffin. There are whiffs of classic Hollywood like Trouble in Paradise and Breakfast at Tiffanys within Priceless. Superficially the simple economy of trading youth for money provides it's own straight-forward morality, but the film visually presents a background world where loneliness and greed betrays a person, and money and control cannot recapture youth nor buy love (an American variant on this world is in the Coen Bros' Intolerable Cruelty from 2003). Locations for Priceless include Biarritz, Monaco, Monte Carlo and Nice, France. The tale of Hors de Prix hinges upon the actors, the usually stone-faced work of Gad Elmaleh (who can stare at the camera and evoke Buster Keaton) and the double-layered approach of Audrey Tautou, quite good as a young, beautiful hustler who doesn't realize she is steadily outfoxing herself as she becomes the one smitten. Wayne plays a character (Hondo Lane) who is something of the antithesis of racist Ethan Edwards, the character he played in the 1956 The Searchers, which is the better movie but only by virtue of the masterful John Ford direction (who also, incidentally, helped out with the last part of filming on this movie because Farrow had to leave the set for another project when Hondo ran over schedule). Each film is a rumination on the dilemma of violent men (with varying degrees of reluctance), and clashing cultures, fighting over the American Western landscape where it is always a cinematic 1870 (particularly Hondo. Ward Bond is on hand, of course, and struggles with remembering the calendar date of whether it is 1869 or 1870. He decides it is 1870). Hondo is given a good presentation from director Farrow, though the gimmick of 3D filming (which is how the film was originally released) intrudes in places with various characters thrusting toward the camera much in the same way the Creature from the Black Lagoon thrust toward the camera in that other famous 3D movie. Like the Black Lagoon, the local area where maybe/maybe-not-widow Angie Lowe (Geraldine Page) lives only looks peaceful and serene for a short time until trouble is stirred up. In the past, Hondo lived with the Apache for five years and understands how the current wave of rising tension between Vittoria, the Apache chief, and the local white settlers has reached a lethal pitch. As he tells Angie after stumbling upon her farm after losing his horse, there's no word in the Apache language for "lie," which is what the treaty between the settlers and the natives has become because the US government has broken the agreement. Based on the Louis L'amour novel, Hondo shows it's literary origins with a kind of dialogue that doesn't show up in other Wayne movies. Not only do we steadily get more layers of personality for the main characters as the film progresses, which is what any decent screenplay does, but the dialogue serves the purpose of also educating us about the tribal customs of the Apache. Aside from the novelistic plot and dialogue, Farrow (and I guess, John Ford) pack in a lot of action sequences which would not be out of place in any other dozen well-made Western films of the 1950s. Good stunt work and a lot of dust getting kicked up by speeding horses, also one of the more unusual dog companions for a hero, makes Hondo simultaneously both a well-done western and something of an apologia for the Apache. At the end, when Wayne and Page tear out of the territory for California, it's not to escape the Apache, but the gossip of the white people. "I'm tired and I'm bored. I think I'll donate my pink and white body to science and commit suicide," says Nurse Blondell after pulling a long shift at the hospital, one of many such shifts without let up. She then suddenly gets reassigned to do a nursing job for the local police, but not before director Lloyd Bacon makes sure we get to watch Blondell undress and put on a negligee, which seems to have been a required visual rite-of-passage for these kind of pre-code films. George Brent is on hand (as Police Inspector Patten) and lets Blondell's character know that "you're really working for police headquarters." He starts calling her 'Miss Pinkerton' as she starts finding clues about what's really going on in the enormous old house where she is assigned to care for an elderly lady. They are surrounded in the home by sinister servants and family, and the apparent murder of a young man of the family who was inexplicably murdered in the home, which has conveniently saved everyone from poverty because of the large life insurance policy he took out just before becoming dead. Blondell tries to sort out the mess and Brent pops in and out. Blondell and Brent present their particular acting speciality with rough skill, but director Bacon doesn't help matters much as most of the other actors deliver their lines flat and as if they're reading them off cards or just suddenly remembering them, with small pauses interrupting some of the lines. This is either from severe under-rehearsal or just the problem of early "talkie" films struggling to work out how to handle recorded dialogue, though by 1932 most production crews had worked it out. But, alas, not here. Miss Pinkerton suffers from the "old haunted house" story line, and the clumsy acting. Bacon does use a lot of inventive camera angles, though often enough its for purposes that add nothing to the story, such as shooting up at characters from between their legs, as if the audience is a nodding baby. Maybe much of the 1932 audience was nodding, since Miss Pinkerton just isn't quite able to put all its pieces together properly. Jim Wormold runs a vacuum cleaner shop in Havana, Cuba, and he's got a problem: his daughter, who he adores, wants a pet horse, a rather expensive proposition to fulfill with vacuum cleaner sales. Even more challenging for Wormold is that she's suddenly older and has become beautiful, and that's attracted the attention of the local police chief (played by Ernie Kovaks) who has his eye on her for his future Mrs. Police Chief. Wormold wants to get her out of Cuba entirely and into a school in Switzerland, but the horse and the foreign school both look well out of his reach when unexpectedly he's given an offer to help the British Secret Service to set up a network of spies. He (Alec Guinness) takes on the work under protest, stating emphatically he has no idea about how to set up a spy network, but all of this is brushed aside by the cane-toting Noel Coward, code name "Hawthorne," who is his UK government contact. "Aren't you willing to serve your country?" Hawthorne asks, and that seems to be enough a credential to set Guinness on his way. With extra money coming in, Wormold can now get the daughter a horse ("Sarafina") and a membership at an expensive and exclusive Cuban country club, but soon the British are pressuring "our man in Havana" to produce intelligence reports. Coached by fellow expatriate Dr. Hasselbacher (Burl Ives), Wormold is encouraged by him to fake intel since that would endanger no one, so he commences to drawing a large, bizarre weapon system that is under construction in the Cuban hills. When this "intelligence" is sent to London, panic sets in about this unknown and potentially lethal super weapon being built in the Caribbean, which they only note in passing has a certain similarity to vacuum cleaner parts. 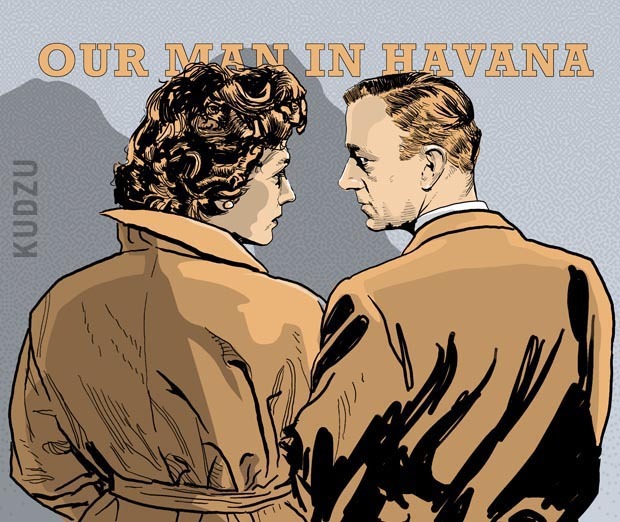 Director Carol Reed layers in some editorial about Batista-era Cuba and creates comedic (and sad) side-stories in the background of this otherwise straight-forward spy movie. Havana is shown as a place of peasants, beggars, bars, lovers, brothels, and the wealthy, but mostly we get chaotic streets of busy people while "The Red Vulture" (Ernie Kovak's police chief) cruises along looking for trouble. 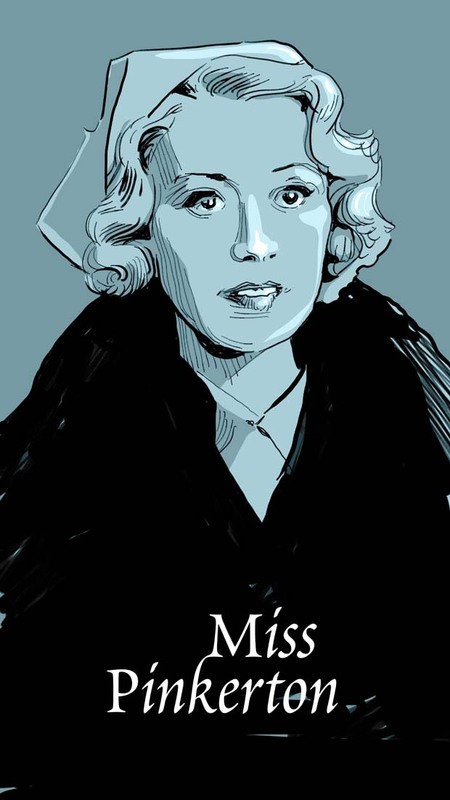 Jo Morrow is the smiling (or pouting) daughter Milly, and Maureen O'Hara as the new secretary Beatrice Severn who is sent in an emergency rush from London to help Wormold "run" his network of spies. What they don't know is that the individuals Wormold has under his command are all made up (sometimes concocted from a newspaper adventure strip Wormold reads), a cast that solidifies into reality when Wormold has to pretend to Beatrice that they really do exist, pointing out varied real individuals across the strata of Havana society, while voicing a convenient cover story of why all of them "pretend" to not know him. Our Man in Havana isn't a perfect movie, and there are some editing lapses which indicate some second-thoughts about the plot occurred in post-production. But the care Reed took in preparing the background of our visual story is evident throughout, the cinematography handsome, and Guinness and the rest of the cast give good, steady performances. Often they are called upon to keep the same straight face as they pass through a comedic scene and into a serious one (and as the tale progresses, a dark tension tries to spread over the story, and this is where Burl Ives excels, despite his meagre use of a Hollywood German-accent, as the desperate Dr. Hasselbacher). 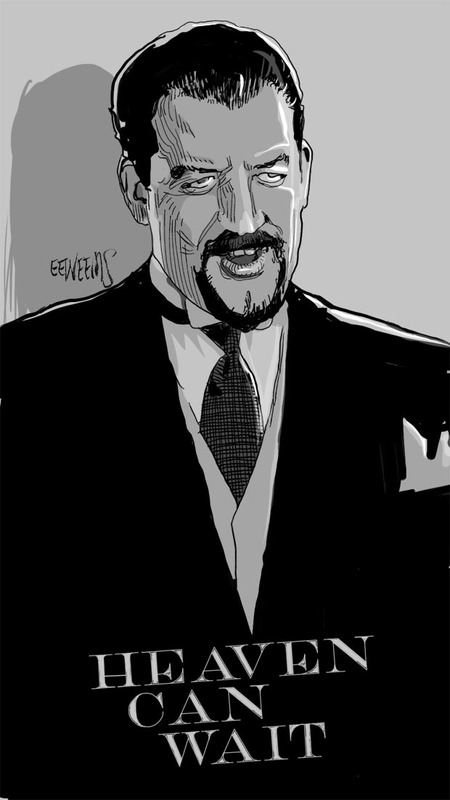 There's some physical comedy and Kovaks gives us a controlled, and controlling, corrupt (and possibly crazy) Captain Segura who nonetheless has a sad, goofy charm to him. "He just sings sad songs about flowers, and death, and one about a bull," says Milly. The screenplay (by Graham Greene from his novel of the same title) delivers irony and humour. For awhile he keeps the vacuum cleaner salesman one step ahead of his scheme, but then the scheme has taken on a life of its own in the streets of Havana, producing unintended, dangerous results. When Wormold's ruse finally unravels and he's got to face the music in London, that's where he really learns how the spy game is played. Is the term "rollicking adventure story" out of vogue? 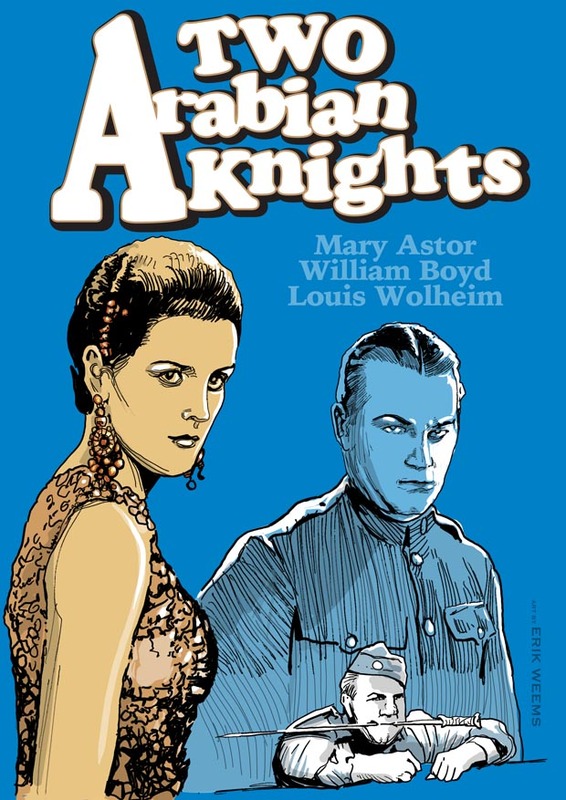 Because that's what this 1927 silent film is, with two American doughboys (William Boyd and Louis Wolheim) in a World War I German POW camp, finally escaping, getting mistaken for Arabs and being shipped to Turkey where they get embroiled in saving a young native woman (Mary Astor) from a forced marriage. Of course Turks aren't Arabs or visa versa, and how these two Americans could be mistaken for Arabs doesn't make a lot of sense, regardless that they're wrapped up in long white terry cloth shower robes and accidentally get into line with kandoora robe-dressed Arab prisoners. Somehow that fools the movie's Germans and that combined with some fast moves gets the two heroes out of wartime Europe. Lewis Milestone keeps the story moving pretty quick. The antagonism (and loyalty) between Wolheim and Boyd's characters who are either busy bickering or saving each others skin makes for a great deal of comedy. When they're finally on the job of saving Mirza (Mary Astor), Milestone tightens the screws on the tension with some clever fighting, running for their lives, and dueling. There's not a lot of multicultural respect in Two Arabian Knights by the two heroes in a foreign land, nor by the eastern villains towards them, referring to them as "dogs". Wolheim, with his battered nose and bulldog face, and the boyish and smirking Boyd, are perfectly romanticized versions of ideal Americans, one wanted in the states for criminality and the other with a habitual problem with authority, neither daunted by the odds against them, which in "real life" would probably make them idiots, but here it just makes them fearless rescuers. Mirza might be a veiled Turkish princess, but she's also somehow an American girl in exotic sparkly outfits, quite receptive to the idea of personal freedom, and ready to spirit out of the mess she's in with her double-dealing, sinister suitor who tries to overcome our heroes with tricks versus fighting fair, which turns out to be his last mistake. Keanu Reeves and Winona Ryder banter back and forth for 90 minutes and are saddled with the dubious job (from the Victor Levin screenplay) of being unlikable. 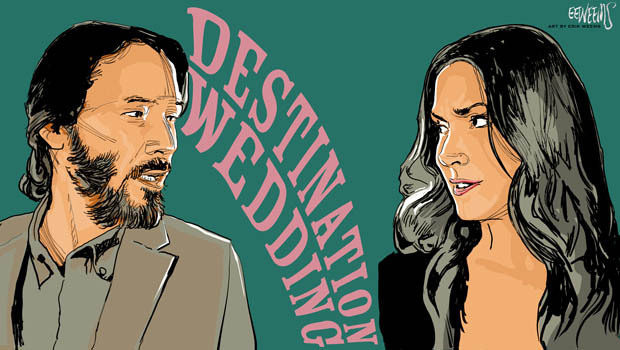 Their witty dialogue is soaked in miserable observations about themselves and other people as the two are unexpectedly put together during the proceedings at a "destination wedding" in California wine country. 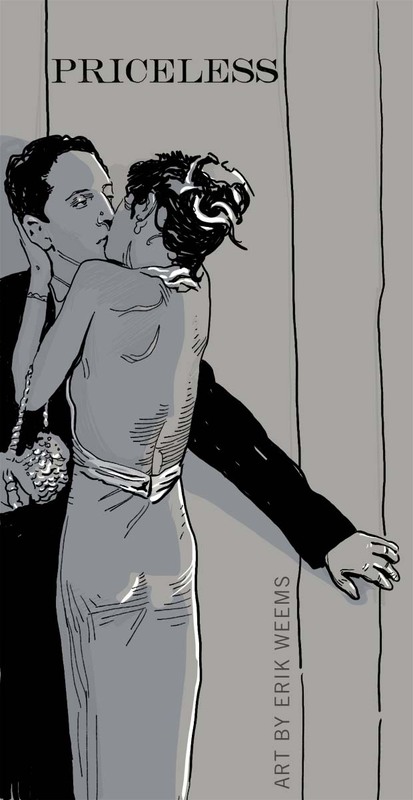 Though there are numerous people in the background, no one has any lines except these two (not counting a hispanic maid we hear briefly from outside of a hotel door), and while the nuptials and ceremony are taking place, the dialogue never stops with our two main characters as they fight their mutual attraction and their agreed upon abhorrence of the human race. This is a hard film to categorize as it is a black comedy but doesn't contain any meaningful element of death (like a black comedy), nor is it a "chick flick" or "date film" since those can certainly contain grim elements of melancholy and self doubt, but not for the entire movie. An interesting moment of victory for love (which takes a continual beating throughout the story) is that we know it has triumphed when the character played by Keanu Reeves finally shuts up. List of films Cinemagraphe wishes would be remastered and made available on HD / Bluray discs for classic film fans in 2019. Local Hero - This 1983 film with Burt Lancaster and Peter Riegert is a comedy from director Bill Forsyth about a Texas oil deal negotiator sent to a small Scottish village in order to buy up the entire town to make way for a sea coast refinery. Instead, he falls in love with the location and the people and begins feeling extremely relunctant to close the deal. A unique comedy full of unexpected contrasts, rabbits, a mermaid, and a Mark Knopfler soundtrack. The Valet / The Closet / The Dinner Game - Francis Veber French comedies, available with English subtitles on DVD, but a genuine HD set would be appreciated. And throw Les Comperes onto it. The Warlord - 1965 film with Chuck Heston as a reluctant 11th century knight trying to deal with the local village peasant population (they don't like him much) from his fortified tower overlooking the coast of Normandy. Supposedly there is an original cut of the film by director Franklin Schaffner that emphasizes the realism of the historical setting, versus the more glamorous studio cut which added in battle scenes and chopped out story. Either one in HD for USA region bluray players would be welcome. He Who Gets Slapped - 1924 silent with Lon Chaney. Chaney's Laugh, Clown, Laugh from 1928 is the better known and appreciated circus movie, but this vicious 1924 silent (and first effort from the newly formed M-G-M) has a sharper story and stays within Chaney's character type of the avenger that no one saw coming (that is, referring to the story cast, not the audience. We can see what's coming from a mile off). Cleopatra - 1963 - The Elizabeth Taylor film called the "most expensive movie ever made" and already widely available in HD in something close to the original premiere version (read more about that here) but is also said to have generated an early 8.5 hour version that is said to still exist. The Incredible Shrinking Man - 1957 sci-fi film that is one of the best of that decade (which was flooded with sci-fi cinema). Available in HD through streaming services and for purchase, but not on HD disc. Meet John Doe - Capra's orphaned 1941 "masterpiece" movie with Stanwyck and Gary Cooper. The Library of Congress seems to have the only valid, quality print of the film. Beat-up versions float around the internet and the streaming services. Ball of Fire - 1941 - Stanwyck and Gary Cooper again, this time in a Howard Hawk's comedy about an encyclopedia team led by Professor Cooper who decide to engage the modern world in order to update their data, and they end up with "Sugerpuss O'Shea" (Stanwyck) in their laps, a burlesque singer hiding from the police. Essentially, this is a screwball retelling of Snow White and the Seven Dwarves, with the 6'3" Cooper as head dwarf, and Stanwyck as the Snow White which wakes up the professor with a kiss (or as it is called in this slang-soaked movie, "yum-yum"). 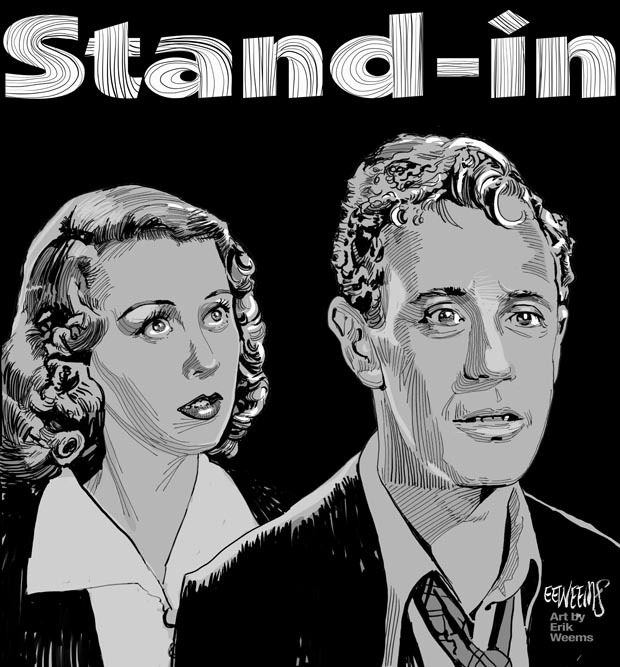 The Charles Brackett and Billy Wilder screenplay accomplishes the stunt of combining 1941 nightclub hipsters (Gene Krupa makes an appearance on the drums) with old professors sitting around singing the complete 1869 "Sweet Genevieve" to each other. A high quality DVD was issued in 2014, but there's no HD.